Tasmania was the second primary site for the reception of convicts transported from the British Isles to the Australian continent in the nineteenth century. Convicts formed the first major group of European descent to settle in Tasmania, and formed the bulk of the community throughout the period of transportation. 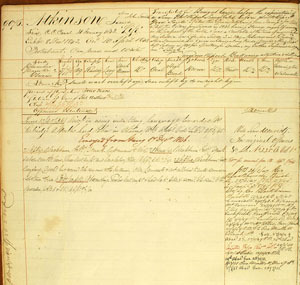 The records held in the Archives Office of Tasmania meticulously document every aspect of the life of each convict in the system, and have provided the basis for research into a wide range of historical topics related to the convict period, as well as genealogical research into family origins. Their survival throughout many years when Tasmanians were more inclined to deny the impact of the convict origins of the state is remarkable. Inscribed on the International Memory of the World Register in 2007. The Memory of the World International Register lists documentary heritage which has been identified by the International Advisory Committee in its meetings in Tashkent (September 1997), in Vienna (June 1999), in Cheongju City (June 2001), in Gdansk (August 2003), in Lijiang (June 2005), and in Pretoria (June 2007) and endorsed by the Director-General of UNESCO as corresponding to the selection criteria for world significance.